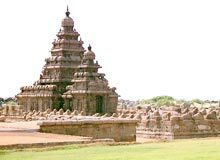 Shore Temple is also acknowledged for being the first stone structure made by Pallavas. Before this, the monuments used to be carved out of the rocks or stones. Unlike other monuments of the region, Shore Temple is a five-storied rock-cut structural temple more willingly than monolithical. In southern India, this is one amongst the earliest and most important structural temples. The spire is extensively decorated with carvings and sculptures. In the recent years, a stone wall has been constructed to protect the shrine from further sea-erosion. Perched on a 50 feet square plinth, the pyramidal structure raises to the extent of 60 feet. Presenting a typical specimen of Dravidian temple architecture, Shore Temple generates an exclusive combination of history and natural splendor. The temple was designed to grasp the first rays of the rising sun and to spotlight the waters after sunset. In the words of Percy Brown, Shore Temple served as "a landmark by day and a beacon by night".